Here’s my review of #GuardiansOfTheGalaxyVol2. So how does James Gunn top his 2014 success? By keeping his brand of humor intact. But while #GOTGVol2 is both fun and funny, it’s not quite as spectacular as its predecessor. I understand that one of any sequel’s most used formula to expand the story is by bringing in the characters’ family members, which is not a bad formula, but having too much of it could result in melodramatic and that is what this movie falls victim to. Written and directed by James Gunn, the story continues as this band of misfits traverse the outer reaches of the cosmos annihilating all kinds of creatures, from one planet to the next. Civilizations would acquire their help but of course their inability to resist mischief leads them to pocketing things on the side along the way and this causes tension. Let’s just say that the team is still having problems working together, they’re all just too stubborn and too proud. Until a certain character from Peter Quill’s past puts this team’s loyalty to each other to the test. So with this sequel, what James Gunn is trying to re-emphasize is essentially the same thing that the “Fast & Furious” franchise keeps on emphasizing again and again with all their installments in that some families are thicker than blood, meaning the connection you have with your friends or people closest to you can sometimes be stronger than with the people you’re supposed to call your own family. So in the process of addressing that, I think “Guardians Of The Galaxy Vol. 2” hits the brakes way too much, we the audiences end up favoring the more dynamic plot rather than the slow one that’s happening simultaneously as opposed to us favoring them all as a whole. There’s a sister issue, there’s a daddy issue, there’s an issue of reforming a gangster into an anti-hero or a misunderstood character, so the Guardians this time around look like they could use a serious therapy session. Kurt Russell does a fine job of accentuating his character’s ego and that makes him live up to his own name, Ego The Living Planet, the master of making it all about himself. But the turn of events halfway through is not much of a surprise, anybody with keen observation could sense the too-good-to-be-true effect coming a mile away. James Gunn reportedly said in an interview that he believes that Michael Rooker’s performance as Yondu in this film is Oscar-worthy, I’d have to agree, I think Rooker excellently plays the art of sympathetic to his advantage, but whether or not the Academy would remember it, that’s a whole other story. I for one am in love with Pom Klementieff as Mantis who I think is just the cutest thing ever. Mantis and baby Groot practically compete when it comes to who is the most adorable in this film. And Dave Bautista just absolutely kills it, Drax’s brutal honesty will crack you up the most, he’s like the roastmaster general of insult comic. The romance between Peter Quill/Star-Lord and Gamora just doesn’t quite land for me, I think it’s because it exists only from opportunity just like falling for a co-worker in the office because he or she is basically whom you encounter every day. But as I said earlier, keeping James Gunn’s brand of humor intact does help. It’s one of this franchise’s perks because Marvel pretty much gives Gunn full creative control and they allow him to push the boundaries when it comes to what can be considered funny. So if you thought the Jackson Pollock joke in the first movie was risqué, brace yourself to hear more of such nature in this sequel. And just like the first film, this too has that retro approach, which could alienate some of the film’s younger fans because they might not understand some of the references. One of the civilizations that has a beef with the Guardians has a massive golden army that operates like a video game arcade and thanks to Peter Quill’s character and his past, a lot of the tone and the style of “Guardians of The Galaxy Vol.2” are catered to us the fans who grew up in the ‘80s. 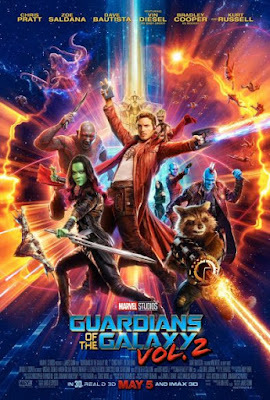 I do enjoy Gunn’s choice of complimenting many of of this film’s sequences with some of the most beloved timeless songs, even Rocket at one point refuses to engage in action until they blast a track on Peter Quill/Star-Lord’s playlist. So does “Guardians of The Galaxy Vol. 2” feel like a repeat of the first movie? To a certain extent, it does, the rest depends on how well you can tolerate a soap opera in what is supposed to be a Marvel action adventure presentation.